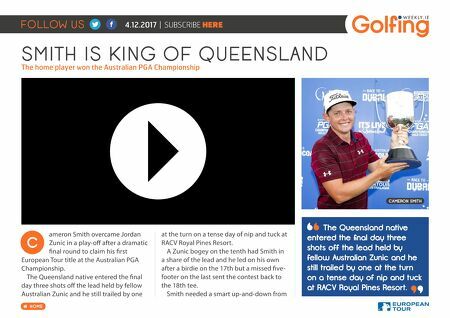 FOLLOW US HOME 4.12.2017 | SUBSCRIBE HERE SMITH IS KING OF QUEENSLAND The home player won the Australian PGA Championship CAMERON SMITH ameron Smith overcame Jordan Zunic in a play-off after a dramatic final round to claim his first European Tour title at the Australian PGA Championship. The Queensland native entered the final day three shots off the lead held by fellow Australian Zunic and he still trailed by one at the turn on a tense day of nip and tuck at RACV Royal Pines Resort. A Zunic bogey on the tenth had Smith in a share of the lead and he led on his own after a birdie on the 17th but a missed five- footer on the last sent the contest back to the 18th tee. Smith needed a smart up-and-down from C The Queensland native entered the final day three shots off the lead held by fellow Australian Zunic and he still trailed by one at the turn on a tense day of nip and tuck at RACV Royal Pines Resort.